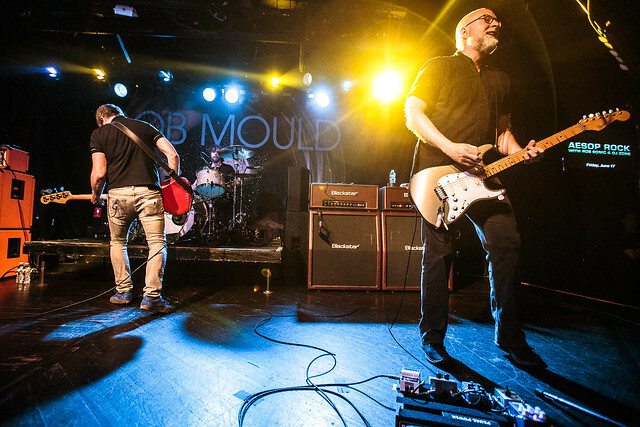 After 90 minutes of standing a few feet from Bob Mould’s jet-engine-roar guitar amps, it feels a bit like someone has turned down the volume knob on the outside world. Mould – prolific solo artist, frontman for 90s alt-rock trio Sugar and co-leader of punk legends Hüsker Dü – maintains at age 55 that louder is indeed better. Ever the master of the power trio, Mould was joined by the ace accompaniment of drummer Jon Wurster and bassist Jason Narducy for a master class in the art of the old-fashioned rock show at the Paradise on Sunday night. Mould is currently in the midst of a late-career hot streak, with this March’s Patch the Sky marking the third in a series of well-received Merge Records releases since 2012 that dial into the essence of his gift for compact, melodic and fuzz-soaked songwriting. Wurster and Narducy have joined him both in studio and on stage for the whole run, and the trio clearly have a special kind of chemistry going on. With Wurster’s punchy technique and Narducy’s high-kicking energy, this night succeeded not as Mould fronting a team of hired guns, but as a full band effort. The set opened with a pair of cuts from Sugar’s 1992 classic Copper Blue before delving into a selection of new material (punctuated by two more Sugar tunes) and concluding with some Hüsker Dü crowd-pleasers. The strength of Patch the Sky and its predecessors, 2012’s Silver Age and 2014’s Beauty & Ruin, combined with the band’s enthusiasm to maintain momentum without the constant aid of oldies. They breathlessly tore through a 20-song main set with little time for chatter or reprieve. The sold-out audience remained curiously low-energy throughout most of the night, but it was never for the band’s lack of trying. Mould and company delivered a visceral performance from start to finish. For his opening duties, New Jersey punk rock lifer Ted Leo offered up a solo electric set spanning his career with backing band The Pharmacists and touching on a few new songs. Leo has spent the past couple of years occupied with The Both, his co-led band with Aimee Mann, and with these unreleased tunes he hinted at both a continuation of that project and a reactivation of the dormant Pharmacists in the near future. For the fans in this crowd cheering on “Timorous Me” and a reworked version of the formerly drum-and-bass diatribe “Ballad of the Sin Eater,” it was clearly a pleasure to hear him digging back into some older songs. On his final night with the tour, Leo joined the Mould band on drums for a spirited Ramones cover (“Beat on the Brat”) that handed over lead vocal duties to Wurster at the start of their encore. The audience loosened up for Wurster’s finest in-your-face punk frontman routine, and when he returned to the kit for the band to finish off the show with Hüsker’s “Love Is All Around” cover segued straight to it’s A-side, Flip Your Wig’s “Makes No Sense At All,” the evening concluded on a loud and satisfying note.